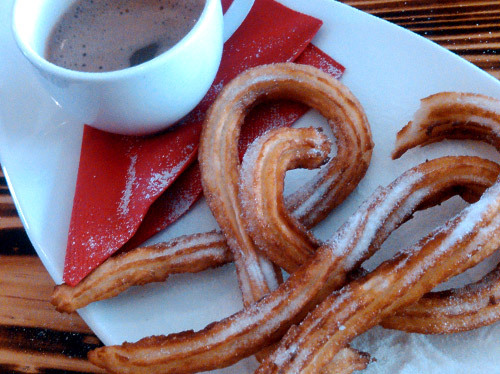 We went to Spanish Flavours not long after they first opened this store in Mount Hawthorn, and were blown away by the great thick hot chocolate that came with the churros. We returned for a mother’s day treat on a Saturday lunchtime. I was surprised to see the cafe tables all empty on a popular weekend for dining out, and after the meal I now know why. I tried the cured spanish chorizo sandwich, which had cured spanish chorizo, roasted peppers, mixed green lettuce on a white roll. Well that is what it should have had. It came out with just some thinly sliced chorizo and a small amount of lettuce. When I questioned this, the waitress said that the menu had been changed and she had not known. The sandwich came back with the roasted peppers and double the amount of lettuce. A bit better, but very ordinary. My mother in law wanted the Ensalada Campera (Spanish Country Style Salad), which should have had potato, tomato, hard boiled egg, olives, onions, red capsicum with sherry vinaigrette. Sorry, no sherry vinaigrette so what about the same thing with mayonnaise instead. So it came out as a pile of potato salad. The Calamares Romana – squid tossed in a crisp golden crumb served with aioli sauce – was not quite crispy golden. 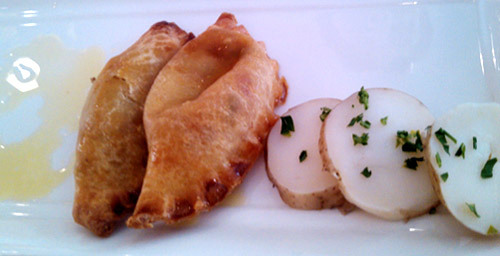 Empananadillas Argentinas – a variety of vegetable and beef with olives in a pastry shell. The pasty was soggy after being microwaved. Sorry we cannot do the cheese plate as we only have on type of cheese. We found out later why our meals may have been so bad – the owner Rosa thought it was going to be a quiet day so she told the chef to come in later, and she had prepared all the meals. I am not sure that it would have made much of a difference. We wanted to finish with what we thought was going to be the highlight, churros and hot chocolate. We ordered one each, which came to nearly $23, for what was a couple of churros each and some weak chocolate drink that tasted like it was made from the powered chocolate. The owner Rosa is very friendly, but did not leave us alone. I guess as they was no one else in the restaurant she had nothing to do – except make our food! She come a couple of times and asked us what the waitress had already asked, and was doing what her waitress should have been doing. I hope they rely on their store selling Spanish and Latin American food products for their income, as the cafe is not going to support them. We won’t be going back. closed Sunday and Monday – now closed always!